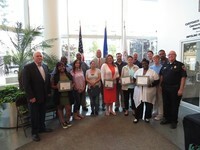 STAMFORD, CT - The City of Stamford held the Citizen’s Public Safety Academy graduation ceremony this week. 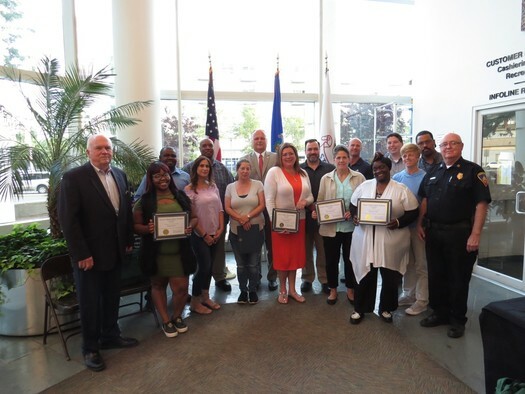 Twenty eight residents completed the nine-week program to learn all about Stamford’s Police, Fire, Health, EMS, Emergency Management, Emergency Communications, and Social Services departments, and the Community Emergency Response Team (CERT). The Public Safety Academy is a unique program and the first of its kind here in Stamford. Participants received an overview of exactly what each agency’s responsibility is and how they respond in emergency situations. Participants were taught to assess safety issues and share their knowledge of public safety practices and policies with others. The graduates from this academy class are also now qualified to become members of the City of Stamford CERT team, a highly motivated and dedicated volunteer citizen organization. This Academy was a hands-on, interactive, behind-the-scenes program, taught by experienced police officers, firefighters, emergency medical, health, social service and CERT personnel. Three of the Citizens Public Safety Academy students shared their experiences with the audience. Mr. Steven Kolenberg said, "I am extremely proud to join the ranks of Citizens Public Safety Academy graduates. As a member of the Board of Representatives’ Public Safety and Health Committee, the material I learned from this course will be invaluable as our committee tackles its important safety issues around our city." The next Citizen Public Safety Academy will be held in the fall. Residents are encouraged to be a part of this program and learn about all the Departments within the Office of Public Safety, Health and Welfare. For more information, please refer to the City of Stamford Website, email tjankowski@stamfordct.gov, or call 203-977-4151.